Today is Thanksgiving. A day to eat, spend time with friends, eat more, be thankful for life’s blessings, and, finally, eat again. In summary, there’s a lot of food. And the main course on practically everyone’s table? Turkey. “A large North American gallinaceous bird (Meleagris gallopavo) that is domesticated in most parts of the world. Failure, flop, especially: a theatrical production that has failed. Interestingly, each one of these definitions applies to the job search. Don’t believe us? Stop packing on the pounds with pumpkin pie and read on. Turkey: A large North American gallinaceous bird (Meleagris gallopavo) that is domesticated in most parts of the world. So basically, gangly birds that travel in packs. When you’re a job seeker, you’re just one applicant among many. One turkey among hundreds. You keep hoping to find something great, but it can seem like you’re just wasting your time. Don’t lose faith! While it’s true that most chickens and turkeys end up on a dinner plate, your career doesn’t have to. Drumstick with it, do your research, prepare, and you’ll be soaring high (like an eagle, not a turkey) in no time. Turkey: Failure, flop, especially: a theatrical production that has failed. The job search doesn’t always go well. Some searches result in filling out applications for jobs you don’t even like. Other times you just don’t make it to the interview stage. In other words, they turn out to be turkeys: complete failures. And that’s okay. You’re not right for every job. You’re allowed to fail. That’s how we all improve and get better. The important thing is to not get discouraged. There’s a perfect job for you out there. You just have to find it. 3 Strikes Makes a Turkey! Turkey: Three successive strikes in bowling. The goal of a job search? 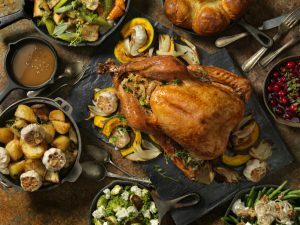 To line up all those turkey failures and use them to set things up for a series of awesome interviews and job offers; three success job search strikes. A bowling turkey! All of that time and effort spent researching online, applying, and interviewing is worth it when you get an awesome job offer. And you’ll often find that success begets success. You’ll get a few job offers at once, or within close proximity to each other. It’s all worth it in the end! Don’t Be a Turkey (Or Do, Depending on the Definition); Call Express Employment Professionals! The job search is hard, just like Aunt Emma’s fruitcake. You can spend hours doing all the right things, and still not land an interview. Want to boost your job search game? After you’re done stuffing yourself and celebrating all things Thanksgiving, give your nearest Express office a call, or apply online. You can also download the ExpressJobs app via the App Store or Google Play. We never charge a fee, and won’t eat the last slice of pecan pie. How is your job search like a turkey? Let us know in the comments section below!